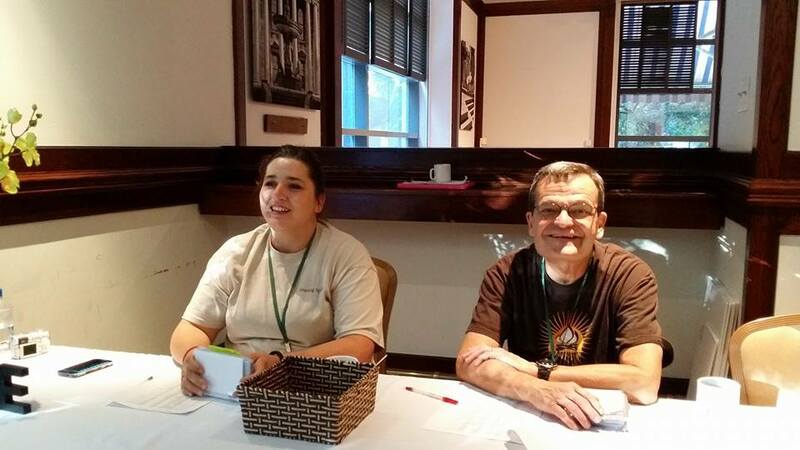 I had volunteered to man the registration desk on Friday morning. For me, it was a nice way to give back, to meet the widows coming in and I didn’t have anything else to do in the morning since that block of workshops didn’t appeal to me. Fred and I sat there, working together to get everyone checked off and given directions. There was an initial rush of people between 8.30 and 10 and then it trickled. Sarah showed up with Timbits. Awesome breakfast, Timbits. She was wandering around on a sugar high, offering them up to anyone interested. Around 10.30 I asked Fred if he could handle the remaining 20 or so left to check in, and at his assent, wandered off to find where the workshops were. My first workshop was a round table: Widowed by Illness or Diagnosis. Out of 30? 40? people there… I was the only one whose spouse did not die from cancer. I listened quietly for the most part while people talked about the cancer, about the horrid-ness about the disease, about how awful it all was – and could not relate. Mark didn’t have a terminal illness. He was supposed to get BETTER dammit!!! Finally at one point, one gentleman asked about hearing so much about the disease and I kinda lost my mind. I don’t have a “disease” or an “illness” foundation to volunteer for or give money to for research to prevent it happening to another. And that frustrates me. That was towards the end of the round table. My next workshop was Signs and Synchronicity. It’s heartwarming to hear the different signs, the different ways that our loved ones come to us and let us know they’re still around. My last workshop of the day was the Heart & Soul intensive with Taryn Davis and Rae Patterson. I am so blessed to have met Taryn last year at Camp Widow – and meeting Rae just enforced the path I feel that I’m heading to. I’m not going to lie. When I first saw that it was a workshop run by two presenters, I was a bit disappointed. The workshop with Taryn last year was SO freaking amazing. And then I got “stuck” with Rae and working with her when they separated the group into two. And I was disappointed because I was SO hoping to work with Taryn again. But things happen for a reason. They happen for a purpose. And I am SO grateful that I got to work with Rae. She is amazing. She is phenomenal. She is a woman that I am SO blessed to have met and worked with. I can’t even describe the workshop – but it allowed us to get in touch with our hearts, open things to a greater level of love. I left the workshop feeling slightly dazed, slightly overwhelmed with the energy and emotion that came from that workshop. It’s been just over a week and I don’t really remember what happened at dinnertime. I’m trying to figure it out… but it seems that my brain has just blanked on that point of the day. 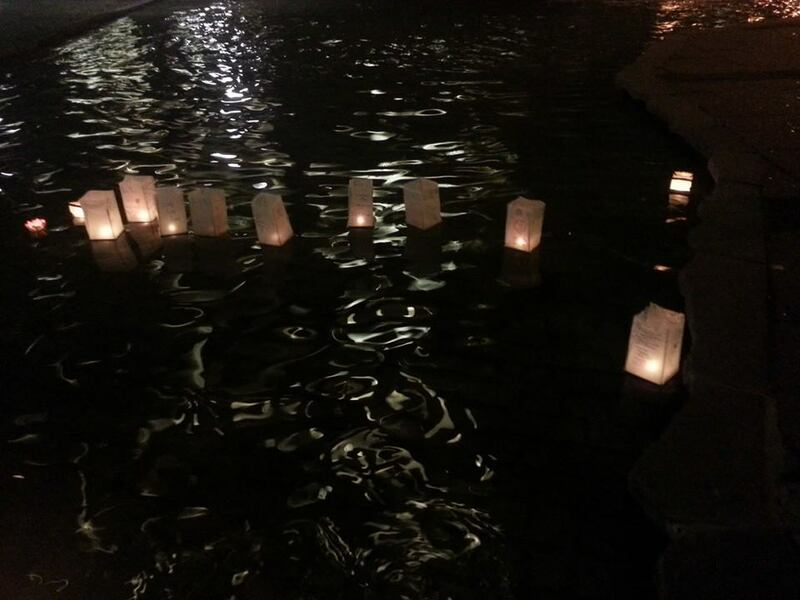 But after dinner, we did a mini-release at the water feature outside. I hadnt’ planned on it – but I ended up helping one lady with her lantern. In helping her, I realized I really did want to do a mini-release and quickly put together a lantern. It was beautiful. The water flow kept the lanterns all in one place just in front of us. I was off, emotional. I wandered over to the labrynth beside the water feature and walked the labrynth for a while. I submerged in the emotions of being a widow and wondered where and when I would surface. I surfaced at the hotel bar. I was still in the emotions of widowhood, feeling weighted down, when I realized I couldn’t get into the room I was staying in. I didn’t want to disturb the women I was staying with – they were out having a good time, so I decided to have a drink with the people who stayed at the bar. I sat there, having a drink or two with other Camp Widow attendees. Side note: that’s one thing I love love love about Camp Widow. I can be miserable. Sit down beside other widows. And they will TALK to me. INCLUDE me. HUG me. LOVE me. And laugh and cry and just BE with me. Everywhere. Everyone. We’re all included. I started chatting with the guy next to me. He wasn’t a widow – he was the son of a widow. There volunteering his time. We talked. We laughed. We got silly. We flirted a bit. We went on a random walk to 7-11 for hot dogs. Tried to break into the pool. Worked out in the weight room. Talked some more. Dangled our feet in the water feature. Checked out the raccoon that was hanging out in downtown Toronto. Talked some more. Laughed some more. I don’t remember the last time I just laughed and had fun and did not worry about anything. I don’t remember the last time I was just me. It was 3am before I realized I needed to go to bed. At that point, I realized my roommates were probably all asleep… and I didn’t know how to sneak into the room without waking them. Finally, at 4am, I went to bed. I carefully opened the door, stealthily grabbed jammies and ducked into the bathroom to change. Came out of the bathroom to climb into bed and there was Angel, thinking I couldn’t get in. Scared the CRAP out of me. Good thing I didn’t yell out. Quite possibly that was one of the best nights in a LONG long time. I am so grateful for Jeremy being there to help me remember that yes, I can have fun. Yes, I can enjoy life. No, laughter is not dead. It’s a beautiful, rare thing for a widow to forget for a little while how much is missing in her life. However… 4am is NOT my friend… I almost missed breakfast… but that’s for part 4. This entry was posted in Camp WIdow, Widow and tagged American Widow Project, Blue Sky Reiki, Camp Widow, Camp Widow Canada, Camp Widow Toronto, inclusive, lantern release, message release, roommates, sneaking in, soaring spirits, soaring spirits international, sslf.org. I’ve always wanted to go to Camp Widow! Sounds like you’re having a meaningful time. Will tune in to see how the rest of it goes (and read past days). Enjoy and hope the rest is as productive and fulfilling.